17 Ridiculously Simple No Bake Pies That You Can Make In Minutes! 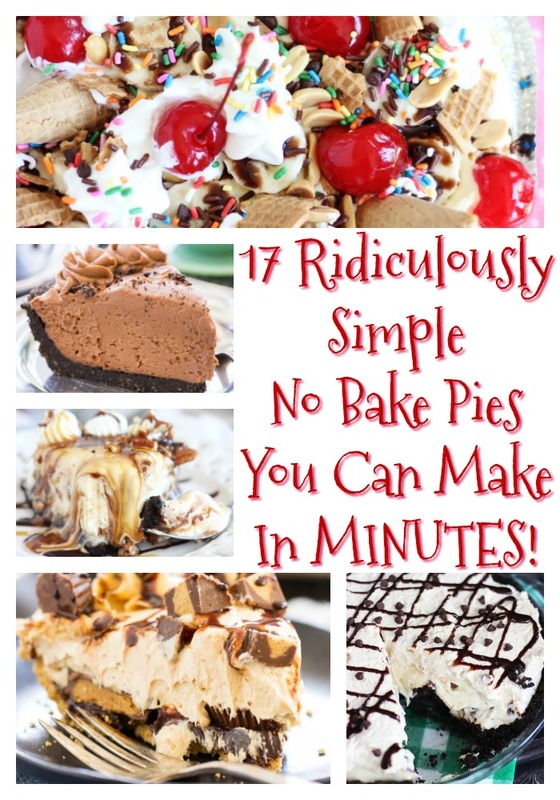 Can you ever have enough quick, easy, and simple no bake pie recipes? There’s no bake pies for all occasions and seasons here! 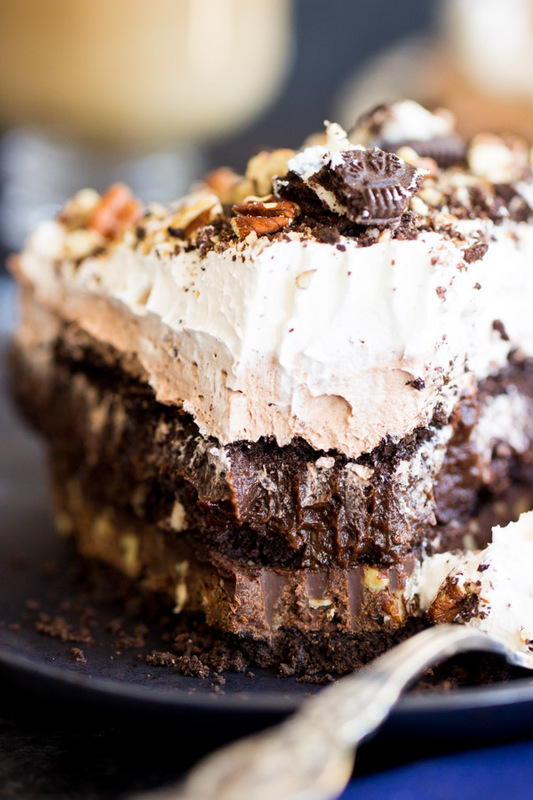 Whatever your pleasure, I have the perfect no bake pie for you! Hi! In the past few months, I’ve really tried to take a look at this site to see what it is you all seem to like the most. There’s a lot of analytics to cull through, but it can be surprisingly challenging to synthesize the info and to recognize patterns. 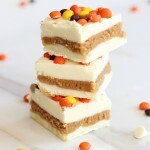 Nevertheless, there was one pattern that was beyond obvious to me – you, dear readers, love No Bake Pies! Through and through, no bake pies are some of my most popular recipes. 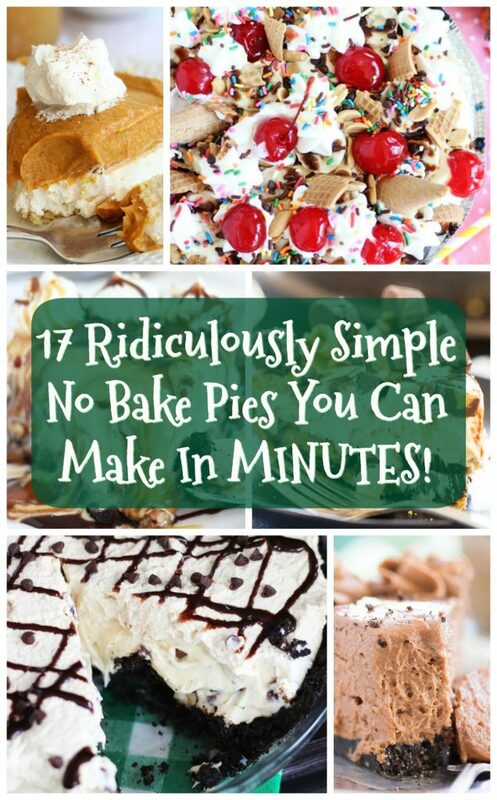 They see a lot of traffic, they get a lot of positive feedback and comments, and let’s face it: there isn’t a person on this planet that doesn’t appreciate a super simple, quick, easy, handful-of-ingredients, no bake pie recipe…. assuming that it’s also delicious, which these are. 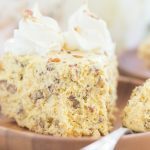 I collected ALL of my no bake pies to this point, and gathered them here in this post. I really want this to be a solid reference for you. If you need a quick and easy dessert, one that’s uncomplicated and doesn’t require a ton of ingredients OR time, then this is your golden ticket. 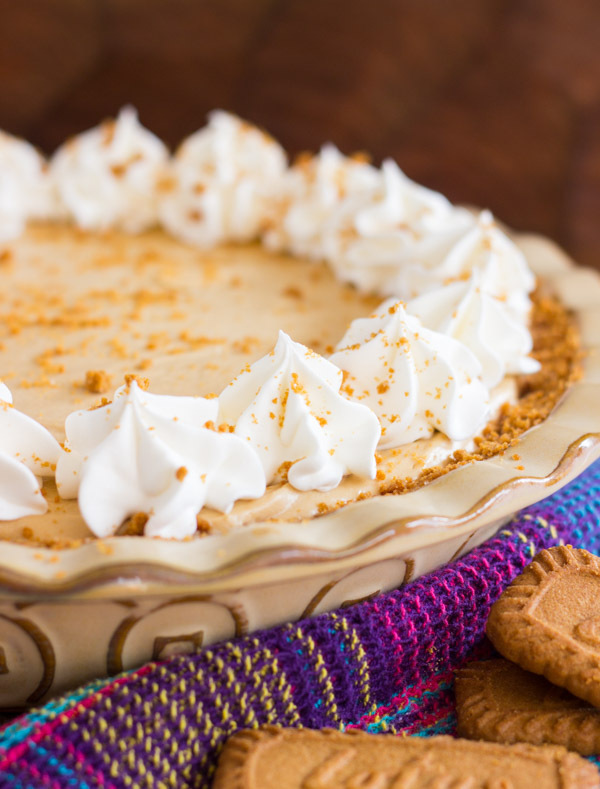 There’s pies for all occasions and seasons – pumpkin ones for fall, eggnog ones for Christmas, a whole bunch of fruity, tropical pies, ice cream pies, and of course, peanut butter. A LOT of peanut butter pies, but what else would you expect?? Whatever your pleasure, I have no bake pies for you! I hope that this collection helps you as a reference! Where to start, where to start?? 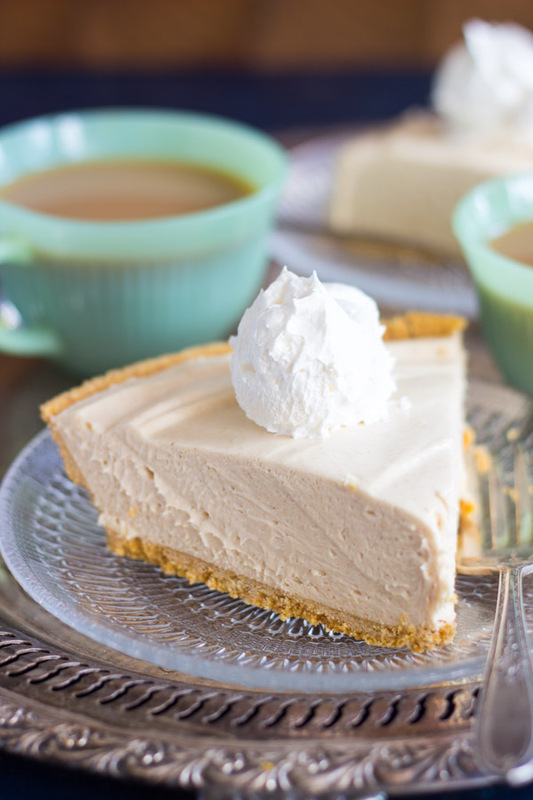 No Bake Peanut Butter Pie recipe: The pie that started it all – my Grandma’s most famous dessert recipe. We make this for every single holiday, and it’s a beloved recipe to my family. Anyone that tries it, lurrrrrves it! 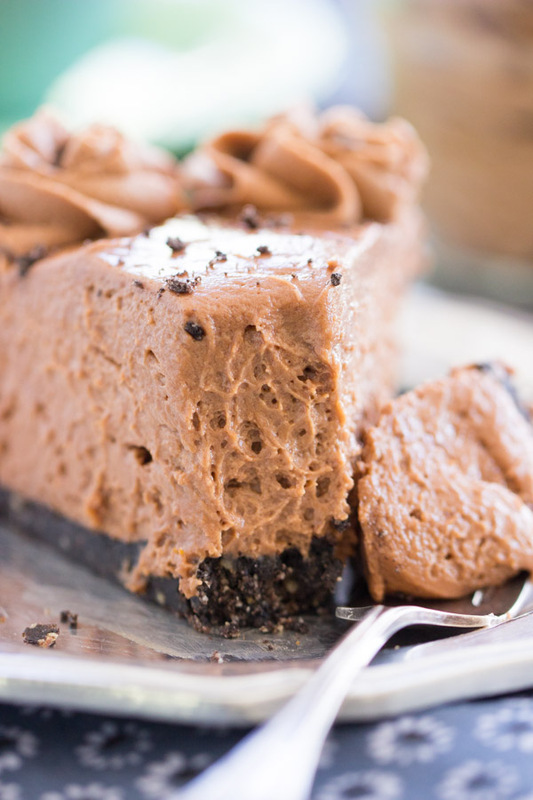 It’s rich, but light, fluffy, and mousse-like. Ready in 10 minutes flat. 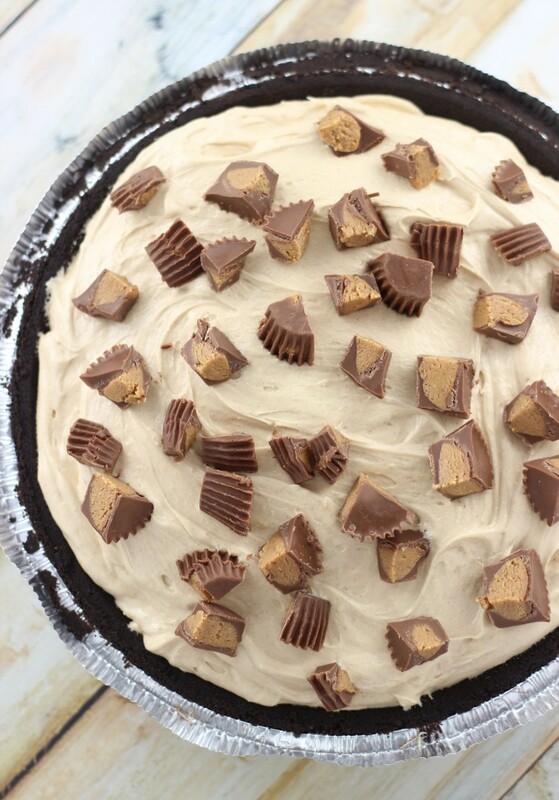 Reese’s Cup No Bake Peanut Butter Pie recipe: This one is my Grandma’s classic No Bake Peanut Butter Pie recipe, but over-the-top with a layer of full-size Reese’s cups on the bottom, and as garnish on top. It’s extremely decadent. Nutter Butter Peanut Butter Pie recipe: Sub out a standard graham cracker or shortbread crust for a Nutter Butter cookie crust and amplify the peanut butter even more! 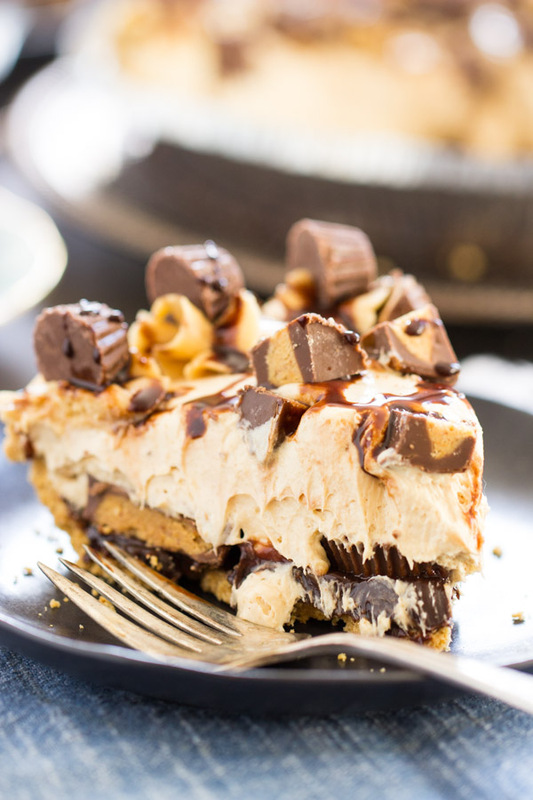 Peanut Butter Cup Fudge Pie: A black-bottomed peanut butter pie recipe that gives you a layer of fudge on the bottom, a drizzle on top too, and a few Reese’s Cups in the mix. 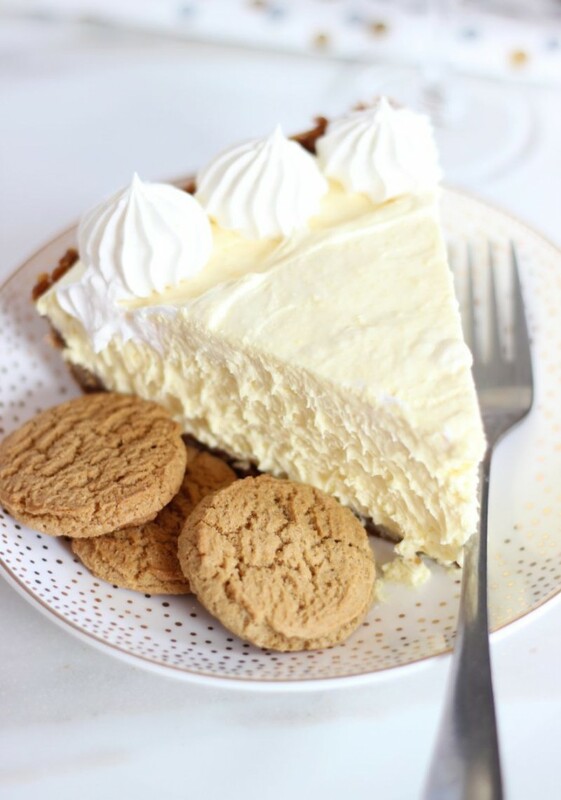 Cookie Butter Cheesecake with Biscoff Crust: Cookie butter is nectar of the gods, and makes for the most fabulous no bake cheesecake! It’s so rich and flavorful. Cannot forget a Biscoff Crust to go with it! 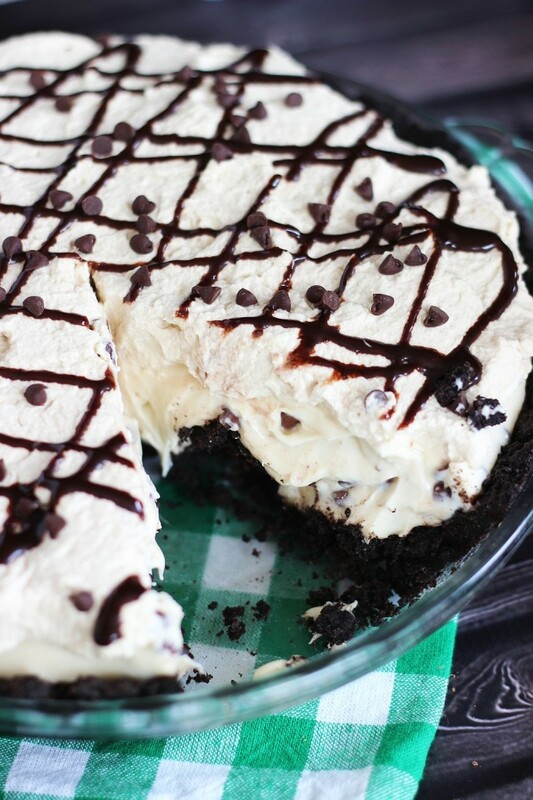 Chocolate Coconut Cream Pudding Pie: Such an epic combo, it’s like a Mounds Bar in pie form. 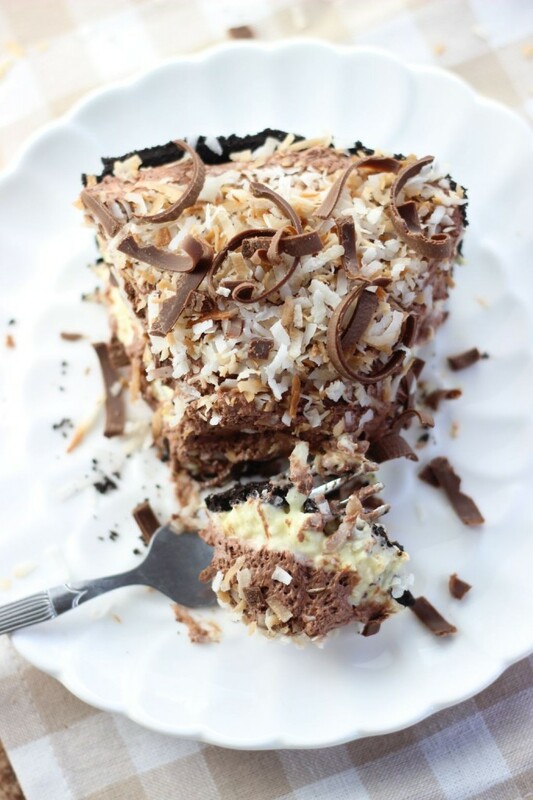 With several awesome layers and then a heap of toasted coconut and chocolate shavings on top. 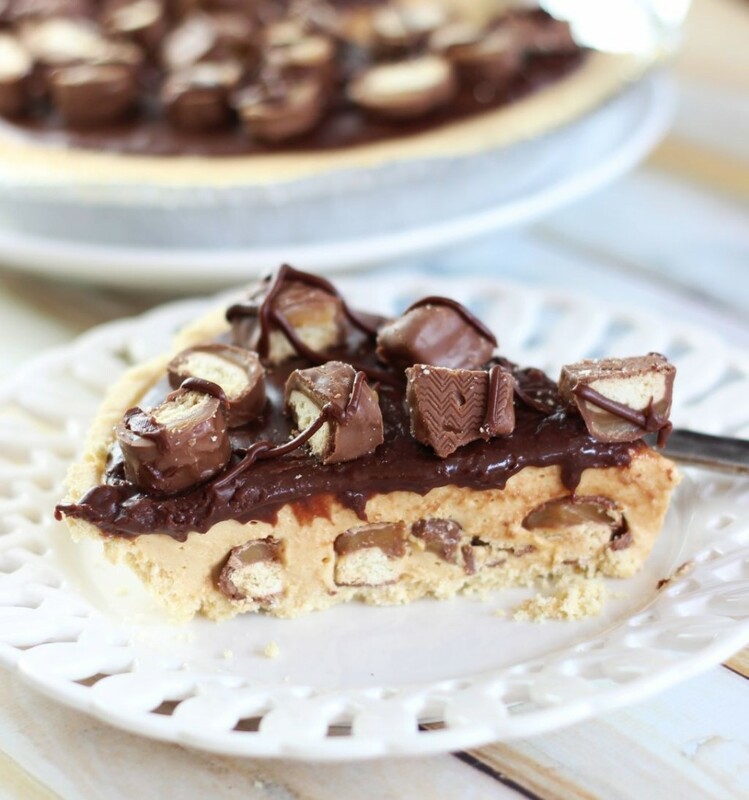 No Bake Twix Pie: The caramel cream pie filling is incredible on its own! But then combined with a shortbread crust and a layer of chocolate ganache, it is to-die-for. Twix bars don’t hurt either. 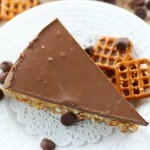 No Bake Nutella Cheesecake recipe: I LOVE THIS RECIPE. In addition to being spectacularly delicious, it’s also a mile high. Perhaps my personal favorite, even over peanut butter pie. I can’t believe I said that. Don’t tell my Gma. 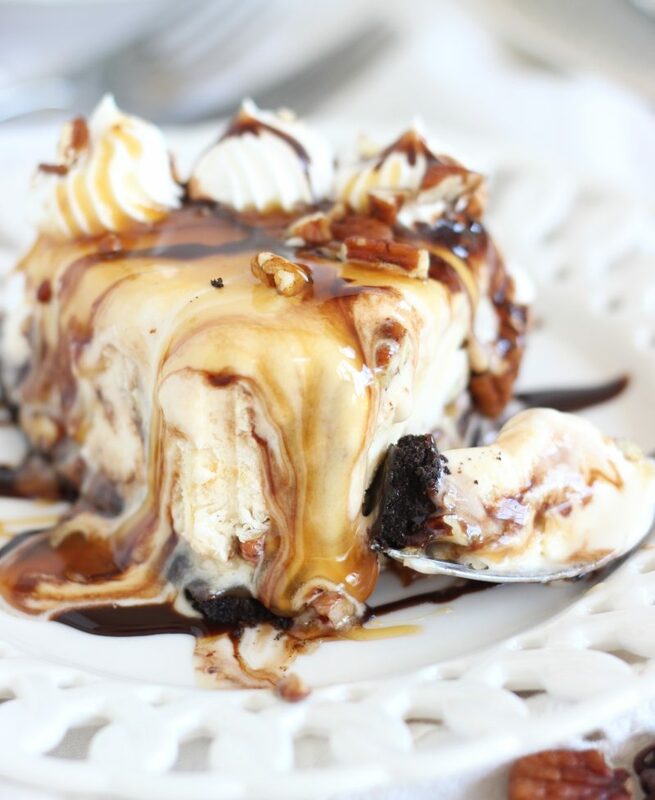 Turtle Ice Cream Pie: Caramel, pecans, chocolate, and ice cream all come together… is there more to life? I would argue not! 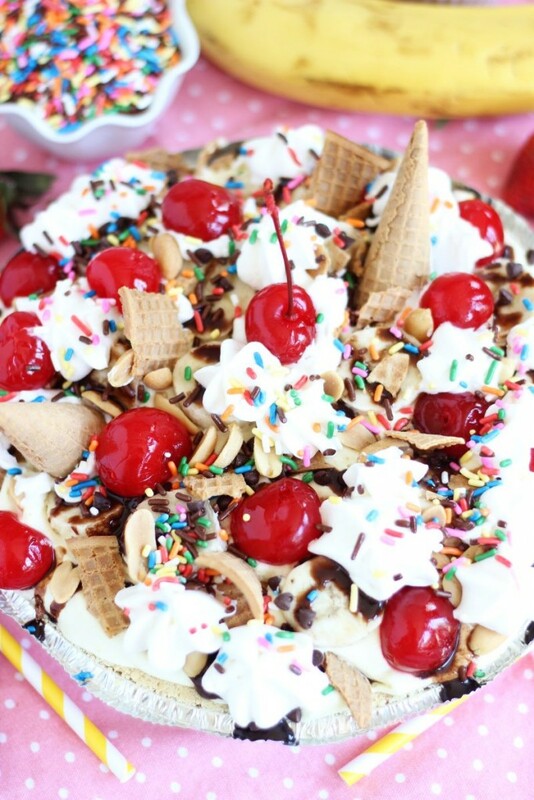 No Bake Banana Split Pie: How fun is this?? I adored banana splits when I was growing up, and they’re still a fave ice cream sundae. This pie has a little of everything in it, including waffle cones! Millionaire Pie (Pina Colada Pie): The popular summer cocktail in pie form. 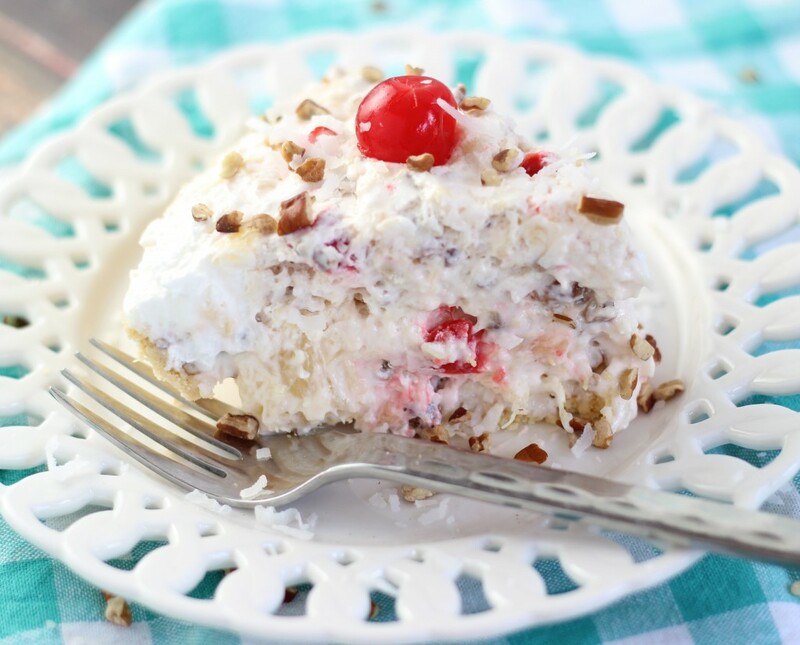 This Millionaire Pie is so fluffy and light, and it screams summer. With shredded coconut, maraschino cherries, pineapple, and a few other goodies! 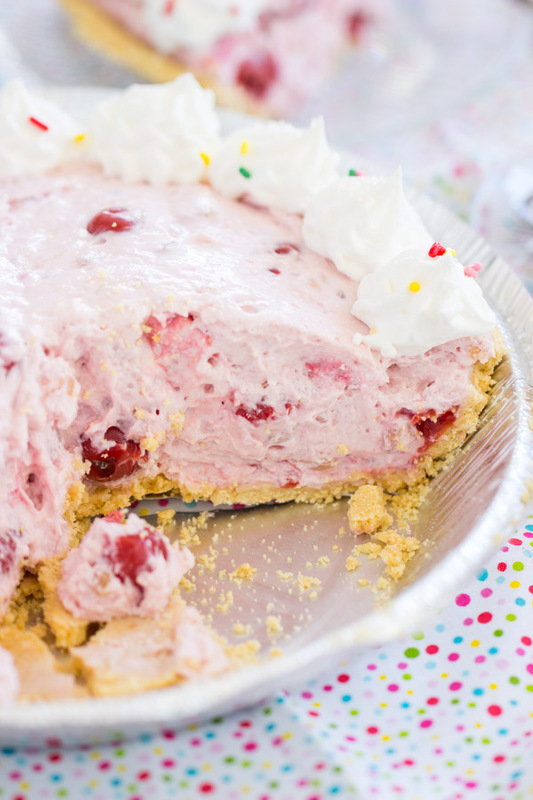 Pink Stuff Cheesecake Pie: My family’s favorite side dish for every occasion, made into a no bake cheesecake. Our Pink Stuff recipe is light, fluffy, and fruity – and preps in about 3 minutes. It’s equally awesome as a super simple dessert! 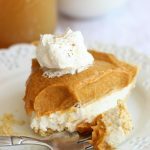 Double Layer Pumpkin Cheesecake – No Bake: This comes together in 10 minutes flat, and it’s such a delightful fall dessert. I’ve made this for so many Thanksgivings over the years. 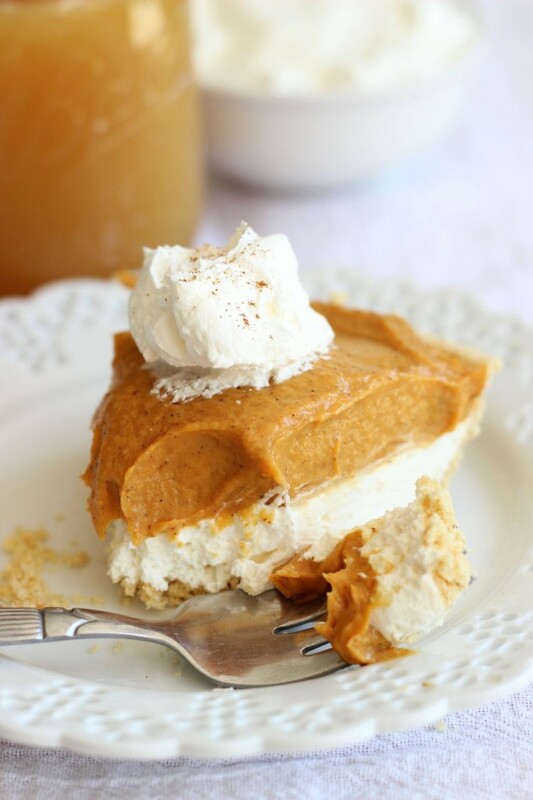 You cannot go wrong with this pumpkin cheesecake recipe. 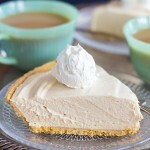 No Bake Bailey’s Irish Cream Cheesecake: The most luscious and creamy no-bake cheesecake EVER. And it’s boozy! And loaded with chocolate! And topped with chocolate whipped cream! I could go on and on, but it’s awesome. 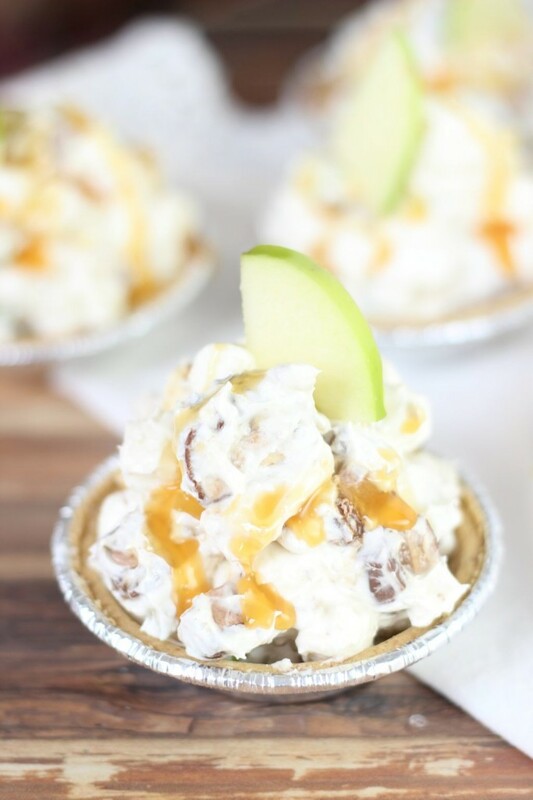 Mini No Bake Caramel Apple Pies: Tart apples, sweet caramel sauce, creamy apple yogurt, bite-size Snickers bars, nuts, and a whole lot more. These pack a lot for itty bitty pies. No Bake Eggnog Cheesecake with Gingersnap Crust: I’ve made this for a few Christmases, and I also took it to my in-laws, and it’s always met with rave reviews! 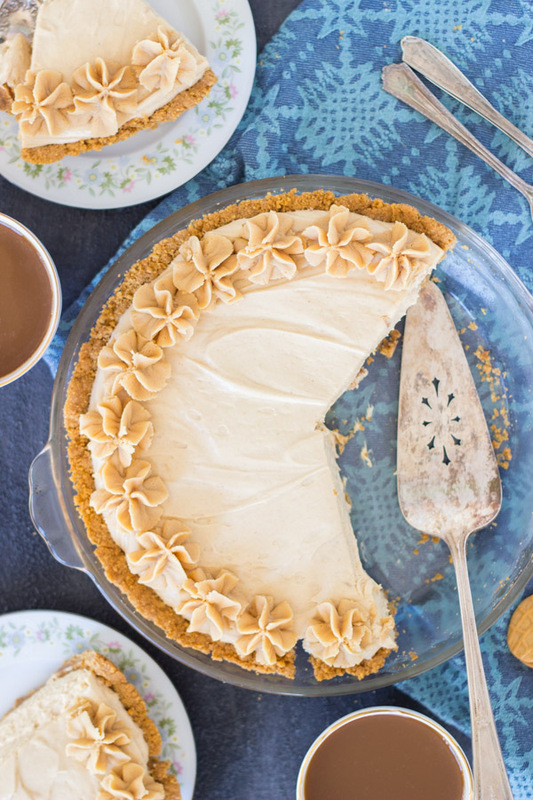 The eggnog comes through STRONG in this pie, and it’s boozy too!